Making your dog throw up isn't a pleasant task. If he has eaten something poisonous, however, it can make a big difference in his chance for a full recovery. If you suspect your dog has been poisoned, before making him vomit, contact your veterinarian or the 24 hour Pet Poison Helpline (800-213-6680) or ASPCA Hotline (888-426-4435) right away. "It is vital that you contact a veterinarian or pet poison hotline for any cases of toxin exposure" before you induce vomiting, advises Dr. Megan Teiber, DVM. 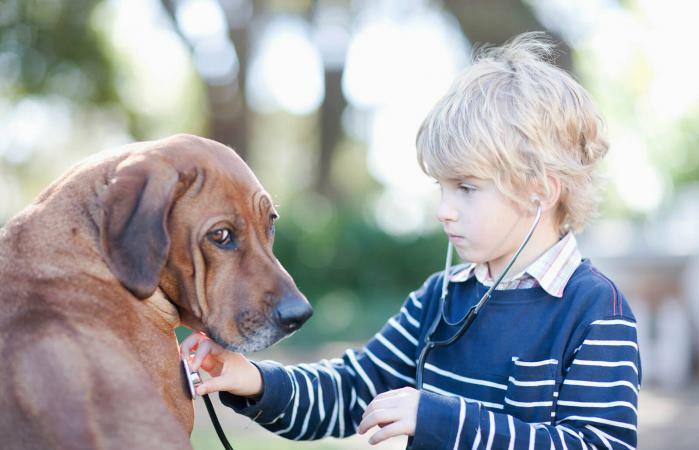 "If you are in a very remote area and absolutely cannot get to a veterinarian, the pet poison hotline will provide you with specific instructions for the safest method for at-home vomiting induction." Depending on what your dog has eaten, "vomiting may not even be needed because your dog didn't ingest a toxic dose of a substance" or your dog ate something where vomiting could make his condition worse. For example, if you want to make your dog throw up chocolate because you know it can be dangerous, you may make your dog vomit for nothing if the amount he ate was not potentially dangerous. Since your dog will be vomiting, it's a good idea to do this process on a floor surface that's easy to clean, such as kitchen or bathroom tile. Alternatively, lay some newspaper or plastic bags on the floor to capture the vomit and protect your flooring. Also, be sure to ask your veterinarian if they need you to catch a sample of the dog's vomit so you can be prepared with a container. Depending on the substance, the vet may want you to do this although not always. 3 percent hydrogen peroxide solution: It should be relatively fresh and not flat from sitting in your cupboard for years. Some food if the dog hasn't eaten recently although this is not required: Adding some food just prior to using they hydrogen peroxide can sometimes make it more likely your dog will vomit. Use the syringe and draw about one milliliter of hydrogen peroxide per pound to a maximum of 45 milliliters. In other words, if your dog is 40 pounds, draw 40 milliliters. If your dog is 60 pounds, draw 45 milliliters. Gently squirt the hydrogen peroxide into the back of your dog's mouth and then wait. If after 15 minutes your dog has not vomited, you can give him one more squirt of the hydrogen peroxide but no more after this. If you are having trouble getting your dog to hold still to squirt the hydrogen peroxide, a trick you can use is to pour it into a bowl and then place some pieces of white bread in the bowl to soak it up. 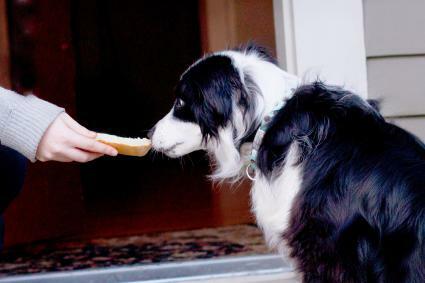 Then feed the bread to the dog. Be careful about cleanup if the dog has ingested anything that might be harmful to you. You can use rubber gloves to be safe. You can find articles on the Internet that suggest that you can induce vomiting in a dog with salt. Others tell you how to make your dog throw up with mustard or how to make a dog vomit with baking soda. These instructions are all to be avoided as they are not safe for your dog. According to Dr. Teiber, "I do not find salt, mustard or baking soda to be effective." Moreover, they can even be dangerous as too much salt can cause sodium poisoning. "Other substances," says Dr. Teiber, "including hydrogen peroxide and mineral oils, can cause severe lung infections if your dog breathes them in while vomiting." There are many items inside and outside of your home that can be dangerous to your dog if ingested. Common household items include certain foods like chocolate and onions, household cleaners, medications, and indoor plants. Likewise, your dog is at risk from substances outside the house, such as toxic plants and trees, and chemicals in your shed or garage such as antifreeze and insect repellants. Once you've spoken to a veterinarian, they will most likely ask you to get your dog to vomit right away to reduce the chances for the poison to do damage to your dog's system. Do not attempt to make your dog vomit without speaking to a medical professional first as there are certain substances where doing this will cause more harm than good. "There are some instances of toxin ingestion in which it is dangerous to induce vomiting, in particular, if a corrosive and acidic substance," states Dr. Teiber. If your dog has ingested substances such as drain cleaners and items with gasoline or oil in them, this should not lead to inducing vomiting. Instead, get your dog to the veterinarian immediately and follow his or her instructions. If your dog has swallowed an object, contact your veterinarian right away for assistance as, according to Dr. Teiber, "it is best to get to a vet for safe induction of vomiting and any other recommended procedures or treatments." If you think you can make your dog throw up a sock, for example, this is dangerous and can cause further obstruction, choking or even death. Vomiting is never fun whether you're a dog or a person. In an emergency, knowing how to help your canine best friend throw up can be a lifesaver. A smart pet owner should always keep a bottle of hydrogen peroxide in their medicine cabinet and replace it regularly so it stays effective if a poisoning situation with your dog ever occurs.